I began performing at Fringe Festivals in 2005 when I brought a comedy show to The Edinburgh (Scotland) Fringe Festival. While I was there, I learned the discipline of performing the same show every night for 30 nights and the thrill when you got it right. I experienced the excitement of being picked up by several variety shows to entertain for them and even jumped out of a cake to celebrate a theater’s 75th birthday. The next year, I returned to the same venue and presented my stories FAREWELL TO THE TOOTH FAIRY to meager audiences and rave reviews. That was the year I knew I was hooked. I started looking for other fringe venues to perform not only my stories, but my comedy and my cabaret. I had been bitten by the Fringe Bug. I found the Rogue Festival in 2008 and told my stories at The Spectrum Gallery. I have returned every year since. This year I am doing the cabaret I developed in Edinburgh and continued in yet another Fringe Festival: The Brighton Fringe just outside of London in the UK where it won the Star of Brighton Award in 2008. The big question is WHY DO I DO THIS THREE TIMES EACH YEAR? It certainly has not made me either rich or famous. The answer is one I do not like to admit. I put on a good show but not a great one. I am not a young aspiring ingénue who has stars in her eyes. 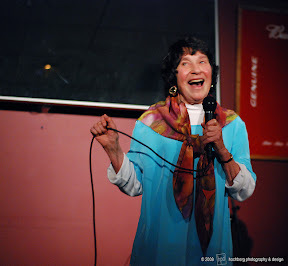 I am an old lady who has fun telling stories and acting silly on a stage. When someone has spent years training to be an actor and invested money and time in perfecting his art, he has a right to expect a bit of notice, a prize, a great review. For me, it is enough to be noticed. I think we performers often lose perspective when our meager audiences are applauding us for a bit of cheap entertainment. We tell ourselves we are a marvelous new light in the entertainment world, but in reality we are doing nice work in a field where one must be spectacular to excel. I do not have the time or the talent to become a superstar. And that is not what I really want. I love sharing my stories and singing nonsense in a voice that would crack glass to people who don’t notice my lack of polish. Indeed, these Fringe festivals are the only places in the world that I can be a star. The more you return to a fringe festival the better your audience response will be. Like anything else, you are building your name. It is foolish to expect to make a fortune and bring down the house the first time you appear at any festival. You also have to be clear what your goals are when you put on a fringe show. My main goal has always been to judge audience reaction and to get reviews I can use to promote my shows at paying venues. Fringe Festivals are not for top stars nor are they vehicles to get you to Broadway or The West End. They are stepping stones to refining and improving your performance in front of an audience and learning presence when you perform. If you go into the process with that in mind, and understand that your audiences WILL grow if you are patient and give it time, you will enjoy your fringe experience. For me each year has been better and better audience-wise and performance-wise. I also make more money every year. Persistence and belief in the quality of your work…that’s all you need….and an optimistic heart. Queenie, the senile stripper comes to Fresno with the show that won Star of Brighton a 5 star hit in Edinburgh & San Francisco. Don’t miss her outrageous parodies with unforgettable tongue-in-cheek comedy, tassels, bells & feathers. Learn more about her on her website.